Many sources refer to an extraordinary event at the end of the French advance into the "United Provinces" (the Netherlands) in the winter of 1794-5. It being a particularly severe winter, a significant part of the Dutch fleet, being icebound near the village of den Helder (at the tip of the peninsula between the North Sea and the Zuiderzee), was defeated and captured by French cavalry and horse artillery. "(when) the ragged men ... thundered on their horses across the ice to capture with naked swords the battlefleet of Holland". These hussars are assumed by de Jonge to have formed the core of the later myth. There is no record (for example from Reyntjes) what was discussed with the hussars, but it is presumed to have been an oral agreement to maintain the status quo until clear orders arrived. Five days later the officers and men of the fleet swore an oath (similar to that already sworn by the men of other ships in the port of Hellevoetsluis) to comply with French orders, not to sail the ships (which remained under the Dutch flag) without French authority, and to maintain naval discipline. This oath was taken in the presence of de Winter, who seems to have arrived in den Helder a couple of days after his troops. 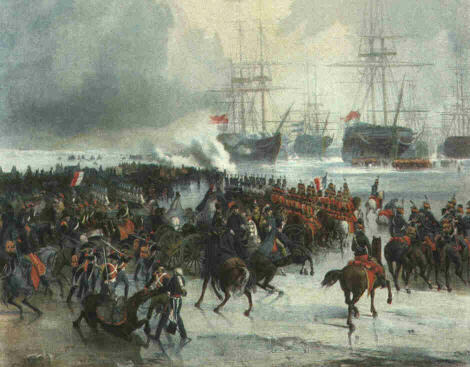 On 21 January, two days before the arrival of the first French forces, Reyntjes had received, via Luitenant-Admiraal van Kinsbergen, the Dutch naval Commander-in-Chief, an order from the Council of State of Holland and Westfriesland to all military forces not to attack or resist the French forces. This was followed up a couple of days later by a resolution of the States-General, the parliament of the United Provinces, dated the 21st, to the same effect. De Jonge considers that, allowing for some overestimation by Lahure of his own role (he also claims, in variance with the record, to have taken the town of Haarlem single-handed), this version is not really in conflict with his own. Lahure does not actually state that fighting took place, and the fact that his men were received 'de bonne grace' does not suggest hostile intent on the part of the Dutch. that his source is unknown, but probably an intentionally or unintentionally exaggerated account by one of the hussars involved. He quotes correspondence with three Dutch officers present in the fleet during or soon after the surrender as evidence that no hostilities were needed or took place. Alison, Sir Archibald. History of Europe during the French Revolution Edinburgh : William Blackwood; 1833-42. Jomini, Antoine Henri. Histoire critique et militaire des guerres de la Revolution Paris : Chez Anselin et Pochard; 1819. Jonge, Johannes Cornelius de. Geschiedenis van het Nederlandse zeewezen" (History of Dutch Maritime Matters) 3rd Edition; Zwolle : Hoogstraten & Gorter; 1869. Lacretelle, Charles. Histoire de la Convention Nationale Paris : Treuttel et Würtz; 1825. Macdonell, Archibald G. Napoleon and his Marshals New York : Macmillan; 1934. Mignet, François Auguste Marie. L'Histoire de la Révolution française Paris : Didot; 1824. Thiers, Adolphe. L'Histoire de la Révolution française Paris : Lecointe; 1823-27.